We are not about to be wiped out by a nearby supernova. The idea of a supernova occurring in 2012 is not new. In 2009 a made-for-cable movie titled 2012: Supernova aired with a typical lackluster plot and B-list actors. The plot of the Roland Emmerich mega-disaster flick 2012 involved solar activity (in that case, the plot hinged on an increased flux of solar neutrinos heating the earth's core). However, a recent press release at the American Astronomical Society meeting lead to misleading headlines that appeared in various newspapers. A press release titled "THE LONG OVERDUE RECURRENT NOVA T PYXIDIS: SOON TO BE A TYPE Ia SUPENOVA?" issued at the American Astronomical Society meeting in January 2010 talks about whether or not a particular recurrent nova is primed to become a supernova. An interesting, if a bit scary, speculative sidelight is that if a Type Ia supernova explosion occurs within [that distance] of Earth, then the gamma radiation emitted by the supernova would fry the Earth, dumping as much gamma radiation (~100,000 erg/square centimeter) into our planet [sic], which is equivalent to the gamma ray input of 1000 solar flares simultaneously. The talk was by astronomer Edward Sion. His paper discussed the former recurrent nova1 T Pyxidis, and whether it is due to become a Type Ia supernova2. As pointed out by Ian O'Neill, Phil Plait and others, the astronomer (Edward Sion) got his numbers wrong (or at least the press release got the numbers wrong) and the star in question is not close enough to cause the damage implied. A supernova would have to be within 25 light years in order to cause that kind of damage, and this one is over 3000 light years away. In fact Sion was called on this at the presentation by Prof. Alex Fillipenko from the U.C. Berkeley Astronomy Department. Apparently the press release used the radiation figures from a Gamma Ray Burst, which is a much more energetic event than a Type Ia supernova. These occur during the core-collapse of very massive stars, and are not associated with the kind of star that T Pyxidis is. Soon on human, everyday-guy-on-the-street terms, means this week or this year. When astronomers use the word 'soon' or the phrase 'in a short time' they can and do usually mean tens of thousands or millions of years. Mike cites a paper by Bradley E. Schaefer and points out that there are things we do not know about recurring novae: We do not know the death rate of these stars in our galaxy, or whether the white dwarfs gaining or losing mass with each flare, or (more to the point of the press release) whether or not they can actually become Type Ia supernovae. In January 2011, a story first published on news.com.au linked a potential supernova of Betelgeuse with 2012. We have a separate article addressing this specific claim. We have shown that the prevailing scientific opinion is that supernova pose no threat to us within several million years. 1. As opposed to a super-nova, a nova is also called a flare star. These are typically white dwarf stars in close binary systems. 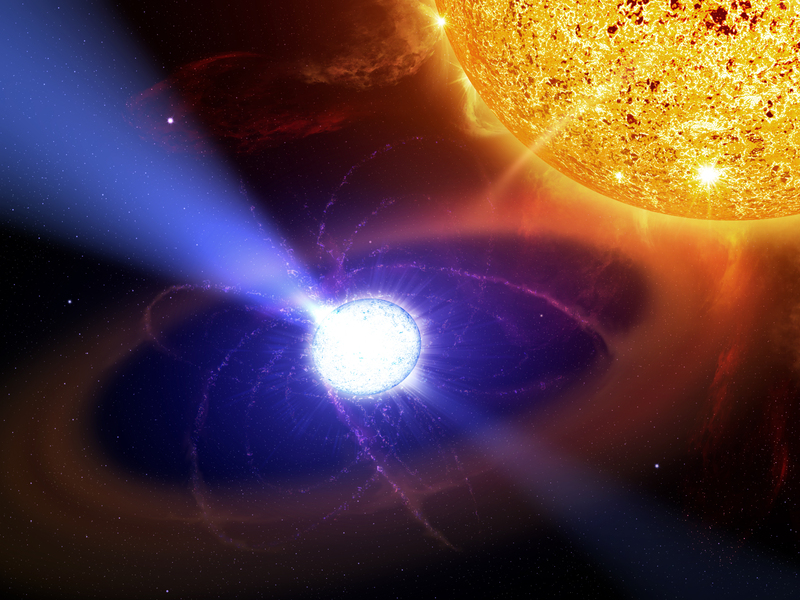 In fact, the white dwarf is close enough to its companion star that it siphons off some of the material from it. This material builds up on the surface of the white dwarf until there is enough for a flare of fusion to begin. The surface flares briefly, and then settles back down. A recurring nova is one that flares multiple times, and sometimes on a fairly regular time period. 2. A "Type Ia" supernova is caused when a white dwarf accrues enough material to pass the Chandrasekhar limit of about 1.44 solar masses. This is the point at which electron pressure can no longer support the mass of the star, and it collapses, turning into a supernova. Because this nearly always occurs at the same mass, these supernova have a very consistent light curve and brightness, and are used as a 'standard candle' to determine distances to other galaxies.